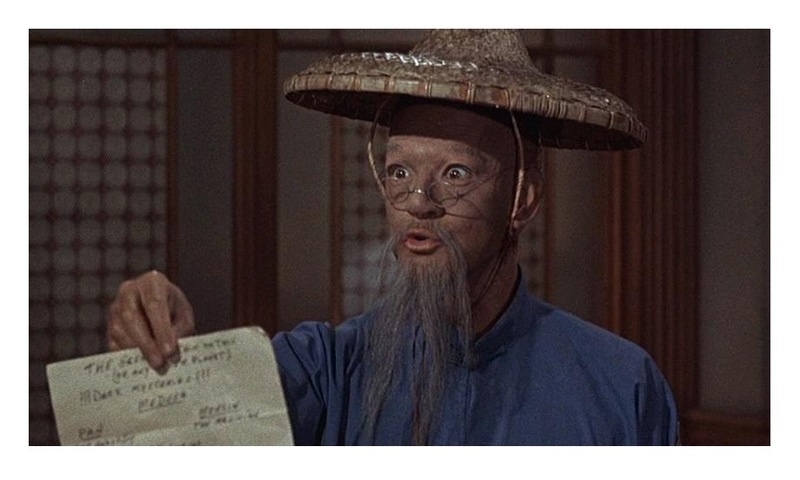 In the late 19th century, a mysterious Chinese man and circus owner, Dr. Lao (Tony Randall, Pillow Talk), arrives in a small Arizona town and proceeds to teach townies a few important life lessons. “The Greatest Show on Earth,” George Pal style. 7 Faces of Dr. Lao is a marvelous piece of magic realism; an affectionate, wondrous pastiche of western motifs, comedy, and fantasy. The film also works as a fairy tale for adults and children alike. 7 Faces of Dr. Lao is an adaptation by Charles Beaumont (The Wonderful World of the Brothers Grimm) and Ben Hecht (Nothing Sacred) of the 1935 fantasy novel The Circus of Dr. Lao by Charles G. Finney. Producer Pal decided to direct the film himself and he did a great job sewing all film elements together; it’s one of Pal’s best movies. “The whole world is a circus if you look at it the right way,” says the wise Dr. Lao. At its heart, 7 Faces of Dr. Lao is a metaphor-ridden morality tale. Each circus attraction is designed to make an observation about the human condition. The film’s moral universe is predicated on the idea that awareness leads to change and happiness. Despite being a morality tale, the lessons don’t interfere with the fun. 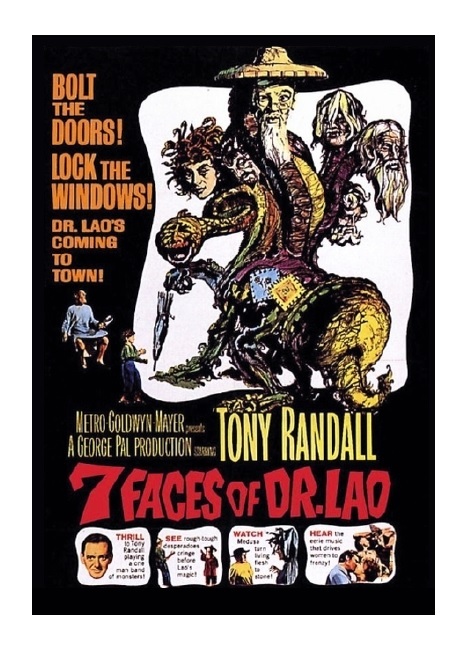 7 Faces of Dr. Lao is a tour-de-force for actor Tony Randall. He plays eight roles — seven plus a cameo — and he is just marvelous. Randall’s Lao is a particularly cunning characterization. Lao is shrewd, but very ornery. I loved how he deliberately drops his cliché Chinese accent throughout the movie, cleverly conveying the idea that people are easily manipulated when you play with their expectations. 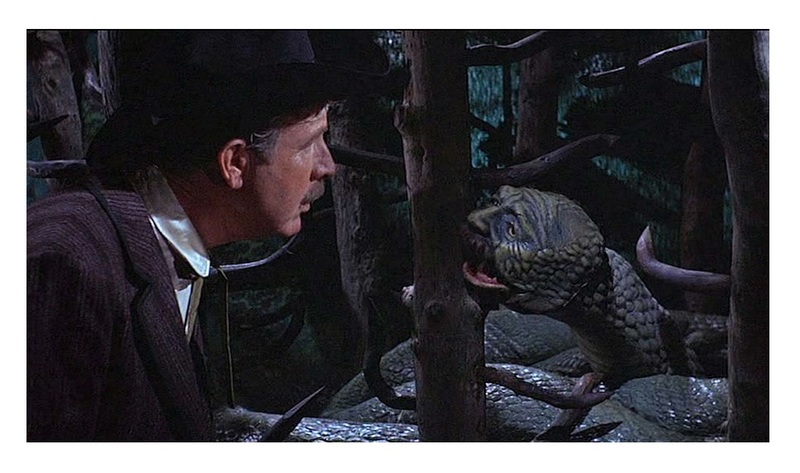 Randall’s performance and Tuttle’s make-up are the raison d’etre to watch the film, but the rest of cast is pretty great too. Barbara Eden (TV’s I Dream of Jeannie) plays Angela Benedict, the Widowed Librarian, and John Ericson (Bad Day at Black Rock) is Ed Cunningham, the Crusading Publisher. Scene-stealers Arthur O’Connell (Pocketful of Miracles), Noah Beery Jr. (TV’s The Rockford Files), John Qualen (A Patch of Blue), and Lee Patrick (Now, Voyager) also appear in key supporting roles. 7 Faces of Dr. Lao is charming, wise and funny. The film doesn’t necessarily push the envelope of fantasy, but its satirical tone and irreverent attitude have an ageless quality. All in all, it’s a helluva fun ride — step inside Lao’s circus tent, you won’t regret it! Color, 100 minutes, Not Rated. I thoroughly enjoyed that Eric, a perfect sunday afternoon film when it’s brass monkeys outside! Loved the Pan and Barbara Eden bit which went into a frenzied and orgasmic fever. Like you say the way Tony Randall kept dropping into different accents was superb. 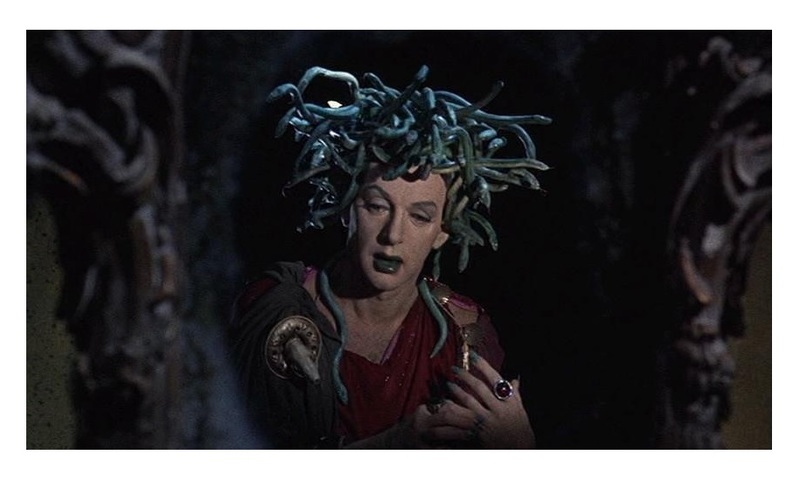 Good morals told in a unique way, lol he was great as Medusa too hehe.